FRANKLIN D. ROOSEVELT. 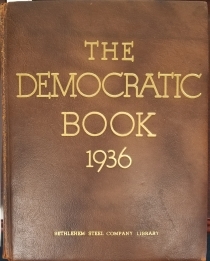 Signed copy of The Democratic Book 1936. 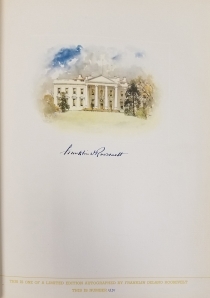 Illustrated, original presentation morocco gilt, with original illustrated wrappers bound in; copy #1531 of 2500, with limitation page signed by Franklin D. Roosevelt; cover gilt stamped “Bethlehem Steel Company Library.” 384 pp., 11 ¼ x 14 ½ x 1 ⅝ in. After President Franklin Delano Roosevelt’s successful reelection campaign in 1936, the Democratic National Committee (DNC) faced a campaign deficit of about $850,000. To pay off this debt, Democrats held Jackson Day dinners throughout the country, addressed by the President by radio. These dinners raised $315,000. In addition, DNC treasurer William Forbes Morgan (1880-1937) convinced the President to sign 2,500 sheets, which were bound into The Democratic Book 1936 and sent to Democratic donors of $250. Purchases brought in more than $400,000 for the party. This lavish report on the administration’s activities in the past year includes essays by many department heads, sketches of other party leaders, histories of the Democratic Party, Congress, and the White House, and biographies of Roosevelt and Vice President John Nance Garner (1868-1967). It also includes FDR’s acceptance speech at the 1936 Democratic National Convention in Philadelphia, the 1936 Democratic National Platform, and the results of the election of 1936. Many American companies provided advertising as well. Democracy is not a static thing. It is an everlasting march. When our children grow up, they will still have problems to overcome. It is for us, however, manfully to set ourselves to the task of preparation for them so that to some degree the difficulties they must overcome may weigh upon them less heavily. I am confident that the people of the nation, having put their shoulders to the wheel, will build a better future for the children of the days to come. Very Good. Minor wear to covers, with some loss to tail of spine; hinge split after page 362, otherwise minimal wear to contents. An attractive copy overall.